I am a big fan of Finnabair and the products by Prima Marketing. While sorting through some of my husbands old Rolling Stone magazines, I came across some vintage John Lennon photos from the 70's. That's when I decided it was time to retrieve the frame that has been lurking in my closet waiting for an idea to emerge. The Finnabair rusty metal Mechanicals and Steampunk embellishments that I ordered from Retro Cafe Art Gallery worked perfectly for this piece as well as the Rising Spirit Archival Cast by Sandra Evertson, also ordered from RCAG. I am quite pleased with the way it turned out. I am waiting for the new products to get my way especially the set of Rust Paste. Their new paints are also awesome and can be ordered from RCAG. 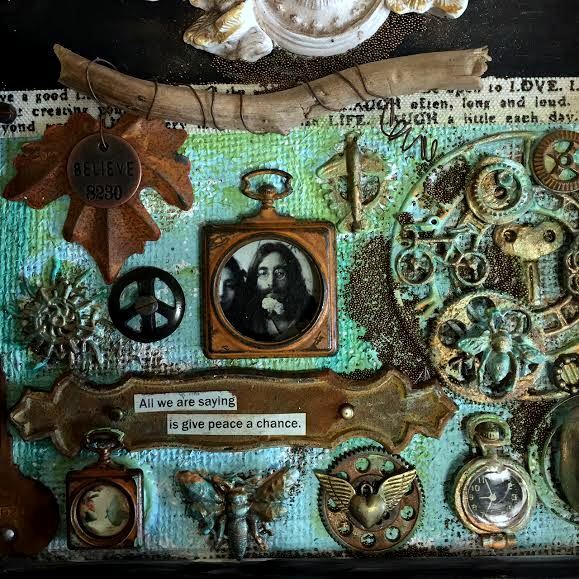 You can see by this photo that I used a vintage eye glass monocle and two rusty screw embellishments by Finnabair. 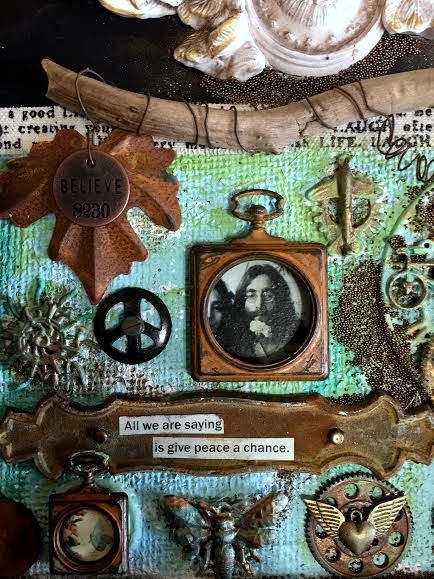 Most of the embellishments here were purchased from Retro Cafe Art Gallery, they have an amazing abundance of cool supplies. 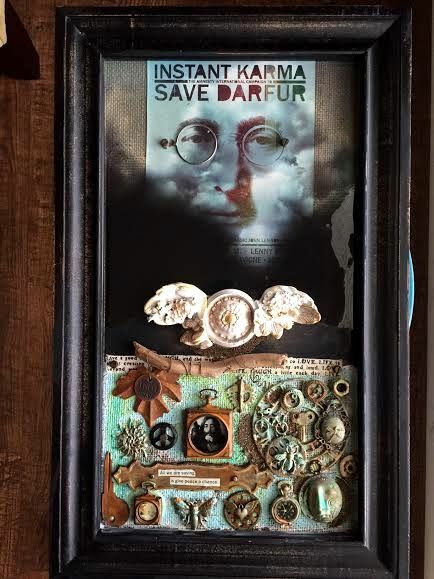 The rusty pocket frame by Finnabair is where I added John Lennon's photo. The back comes off and you can use it a variety of ways. 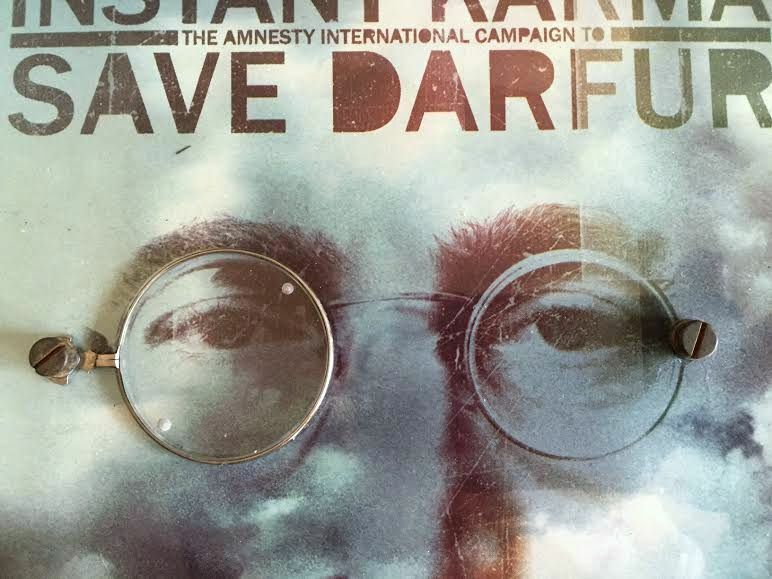 The Peace sign is a vintage metal button. The words are from the article where I found the photo's and the wood piece I added as a nice addition to the metal leaf. This was my first time to use Finnabair's micro beads and the micro powders, both of which are awesome. I was lacking the paint (which I plan to order from RCAG) but the acrylic paint I had worked fine here after applying a layer of white and black gesso. 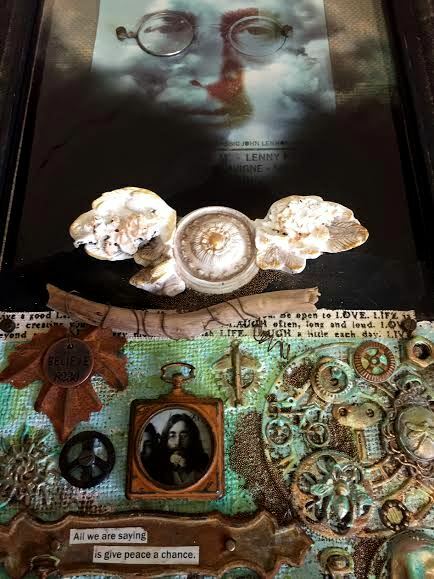 I couldn't resist adding one of Sandra's Relics and Artifacts and the Rising Spirit was perfect for my piece. 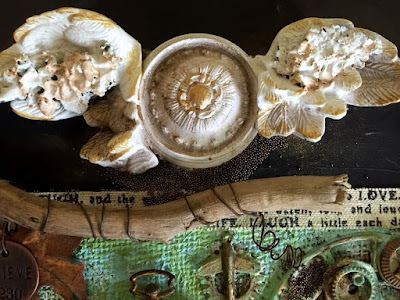 I used an ivory white paint with some copper mica powder and I added some dried bark moss that I found on one of my walks (yes, I gather supplies from everywhere I go) which I think added nice texture. The edges turn brown on their own after adding paint. I think this may be one of my favorite pieces for a lot of reasons. If you haven't checked out RCAG, that's a MUST as is Sandra Evertson's Relics and Artifacts and of course, Finnabair. My next post will be on some of the Relics and Artifacts I just completed. I had someone just tell me recently that they would like to try the Relics and Artifacts but they didn't think they would be good at it.. I alway refer to one of my favorite quotes (on my side bar), "All things are difficult before they are easy". I have a lot to learn using most new products, but I won't know unless I begin. Relics and Artifacts are very easy to use and truly if you just let them guide you and listen to your own voice, you will love what you make and then the ideas just start flowing. I guarantee love and addiction.